The muscle atonia that characterizes REM sleep results from the hyperpolarization of the spinal cord’s motor neurons by glycine, an inhibitory neurotransmitter released by neurons in the brainstem. Researchers have found, however, that the motor nuclei of the cranial nerves are not strongly inhibited by glycine, which would explain why movements of eye and facial muscles persist during REM sleep. When you are awake, your brain’s wakefulness circuits exert controls that prevent you from displaying the forms of brain activity that characterize REM sleep. But in the human fetus, these controls are not yet in place, which may explain why, during the last few months of gestation, the fetus spends such a large proportion of its sleeping time (about 80%) in REM sleep. Activity in the brain’s wakefulness circuits, promoted by stimuli from the internal and external environments, prevents the onset of sleep. These neuronal wakefulness circuits can thus be described as an inhibitory permissive system for the two types of sleep, non-REM and REM. 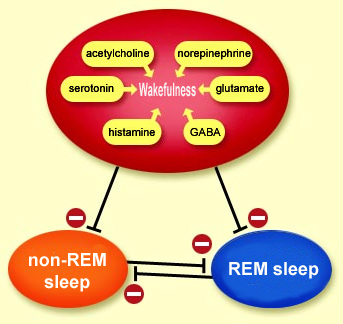 Only when the inhibition imposed by this system is lifted can the brain go through the alternating periods of non-REM sleep and REM sleep, which involve diametrically opposite metabolic states. In non-REM sleep, the basal metabolism is lowered to save energy. In REM sleep, the metabolism is high–just as high as when the individual is awake. Except in the presence of certain pathologies such as narcolepsy, the first period of sleep is always non-REM sleep, and its purpose is often regarded as being to prepare for REM sleep. This period of non-REM sleep begins with the disappearance of the cholinergic effects of wakefulness, which disinhibits the “pacemaker” neurons of the thalamic reticular nucleus. These neurons then impart their rhythm to the thalamocortical neurons, which then in turn induce their “slow waves” throughout the cortex. As non-REM sleep grows deeper, the aminergic neuromodulation exerted by the neurons of the locus coeruleus and the raphe nucleus also subsides gradually, preparing the brain for REM sleep. During the first stages of non-REM sleep, the discharge rate of these noradrenergic and serotonergic neurons decreases slightly, but during the transition from non-REM sleep to REM sleep, it decreases dramatically, until these cells almost completely stop firing. 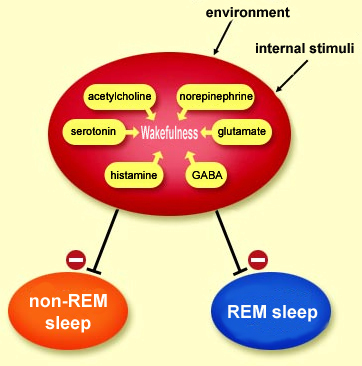 The cellular mechanisms of REM sleep are complex, because its onset is inhibited not only by the permissive system of the wakefulness circuits as just described, but also by certain systems that come into play during non-REM sleep. Be that as it may, the removal of aminergic inhibition combined with the effects of other factors can be said to release the “executive mechanisms” for sleep, in which acetylcholine plays a central role. The neuronal populations associated with wakefulness, non-REM sleep, and REM sleep thus act somewhat like switches for one another: one of these states becomes active when another ceases to be active, and vice versa. For example, such switch mechanisms control the two totally different modes of brain function that REM sleep and wakefulness constitute. In these two modes, the brain’s activity is similar in all respects, except in certain specific populations of neurons that make all the difference. It is convenient to describe these populations as being “on” (active) or “off” (inactive) during the various states of wakefulness and sleep. Some neurons, such as the histaminergic neurons of the posterior hypothalamus , become active as soon as a person is awake but are completely silent during REM sleep. They are therefore described as “wake-on” or “REM-off”. Other, cholinergic neurons in the medulla oblongata and the pons that become very active during REM sleep but are inactive during waking periods are called “REM-on” or “wake-off”. Various groups of “REM-on” neurons have been identified for each of the intrinsic features of REM sleep. Taken as a whole, these various groups of neurons constitute what is called the “executive system for REM sleep”. For example, the muscle atonia characteristic of REM sleep (see sidebar) results not from a passive relaxation of the muscles, but rather from the blocking of the spinal motor neurons by other neurons that produce glycine. These latter neurons are thus categorized as “REM-on”, as are the glutamatergic neurons that project to the cholinergic neurons, to the GABAergic neurons of the posterior hypothalamus, to the oculomotor nuclei (the eyes move during REM sleep), and to the medullary reticular formation responsible for muscle paralysis. Lastly, two other groups of “REM-on” neurons play a key role in REM sleep. The first group, in the oral pontine reticular nucleus , show little or no activity during waking periods and non-REM sleep but are very active during REM sleep. The second group consists of certain GABAergic neurons that inhibit serotonergic and noradrenergic activity during REM sleep. No more than about 50 minutes after a period of REM sleep begins, the REM-off neurons become active, releasing norepinephrine and serotonin. By countering the effects of acetylcholine, these neurotransmitters switch off the intense activity associated with REM sleep, and this period of REM sleep comes to an end. The role of serotonin is especially complex, because this neurotransmitter is also directly involved in the process of falling asleep. The dendrites of the pyramidal neurons in the cortex receive many connections from other neurons. When the afferent axons from these other neurons are activated, their terminals release neurotransmitters into their synapses with the dendrites on the pyramidal neurons. Some of these neurotransmitters excite the pyramidal neurons, while others inhibit them. When an excitatory neurotransmitter such as glutamate has been released, it binds to the postsynaptic receptors for glutamate on the pyramidal neuron’s dendrite, causing channels to open in its cell membrane and let positively charged ions flow into the dendrite. This positive inflow makes the extracellular environment slightly negative. The excitatory postsynaptic potential then propagates down the dendrite to the pyramidal neuron’s cell body, creating a flow of ions that generates another weak electrical current, this one running parallel to the surface of the cell membrane rather than passing through it. It is the sum of the currents generated more or less synchronously by thousands of cortical neurons that is detected by the electroencephalograph electrode attached to a subject’s scalp. The electroencephalograph then compares this sum to that detected by a second electrode placed a certain distance away on the scalp. By convention, a more negative current is represented by an upward deflection in the EEG trace. An electroencephalogram (or EEG) provides a visual record of the overall activity of the neurons of the cerebral cortex. The traces in an EEG oscillate in certain rhythmic patterns that reflect the fluctuations in the individual’s state of alertness. These rhythmic oscillations are determined in part by the activity of the neurons of the thalamus and the feedback loops that these neurons maintain with the cortex (see sidebar). Each of these thalamic neurons spontaneously maintains its own rhythmic activity and can hence be regarded as a single-neuron oscillator. Through a particular set of membrane-potential-dependent ion channels, these cells can send out action potentials at a certain rhythm without having to receive any external stimulus to do so. But how do the spontaneous, rhythmic action potentials from these thalamic neurons act as a powerful pacemaker for the entire cortex? The answer is that these neurons synchronize their activity through association mechanisms similar to those used by multineuronal oscillators. Thus, through their rich axonal projections to the cortex, a relatively small group of thalamic neurons can cause a far larger group of cortical neurons to oscillate at the same frequency as the thalamic neurons. Researchers have found that damage to the thalamus can reduce these cortical oscillations, or eliminate them completely. Adapted from Neurosciences, Purves, Augustine, Fitzpatrick, Katz, LaMantia, McNamara, Williams, and De Boeck, Eds., 2003 Recording of the activity of a cortical neuron, with the oscillating pattern characterizing sleep and the tonic activity characterizing wakefulness. The thalamic neurons that project their axons to the cortex have another important electrophysiological property as well: they can toggle between two steady states. One is the spontaneous oscillatory activity just described, which is intrinsic to them; the other is the tonic activity that occurs when these neurons are depolarized by external inputs. This depolarization occurs during periods of wakefulness, and the inputs that induce it come from the reticular activating system in the brainstem. It is when the thalamocortical neurons are in this state of tonic discharge during wakefulness that they can send information about peripheral stimuli to the cortex. Conversely, hyperpolarization of the thalamocortical neurons stabilizes their oscillatory state. This hyperpolarization is induced by inhibitory synaptic inputs to these neurons from the GABAergic neurons of the thalamic reticular nucleus. These GABAergic neurons receive projections from both the brainstem and the cortex. When these neurons transmit action potentials, they hyperpolarize the thalamocortical neurons, which then enter their oscillating state. During a sleep spindle (a phenomenon observed mainly during Stage 2 non-REM sleep), the series of impulses transmitted by the GABAergic neurons of the thalamic reticular nucleus hyperpolarize (red arrows) the thalamocortical neurons and cause them to generate action potentials (red triangles). 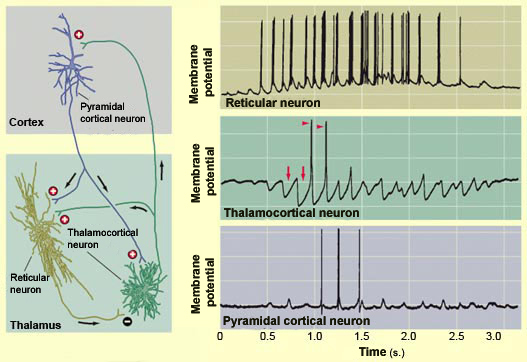 These action potentials are transmitted to the pyramidal neurons in the cortex, where their summation produces the sleep spindles recorded in the EEG. When the thalamocortical neurons are in this oscillating state, they cause the cortical neurons to become synchronized with them, thus causing a disconnection between the cortex and the outside world. This disconnection is of course greatest during Stage 4 non-REM sleep, when the frequency of the EEG trace is lowest and its amplitude is highest. These are also the times of night when it is hardest to wake someone up.